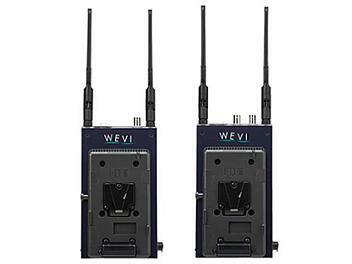 Reliable wireless system provides stable, professional quality audio/video stream from NTSC, PAL, and SECAM sources. No license required. Auto-adjusting WLAN bit rates adapt to changing environment. WLAN bit rates of 24Mb/s, 12Mb/s, 6Mb/s provide MPEG2 video bit rates of 14Mb/s, 8Mb/s and 4Mb/s. Operates in 5.2GHz 802.11a band with hopping technology to reduce interference. AES encryption for secure wireless transmission. Video loop-through provided at transmitter to allow local monitoring. Uses IDX ENDURA power systems.